Jamstress Kirsten Farabi grew up in a family of preservers—her own line of boozy preserves was inspired by the entrepreneurial spirit of her grandfather, "Puff," a sugar and spirits bootlegger. 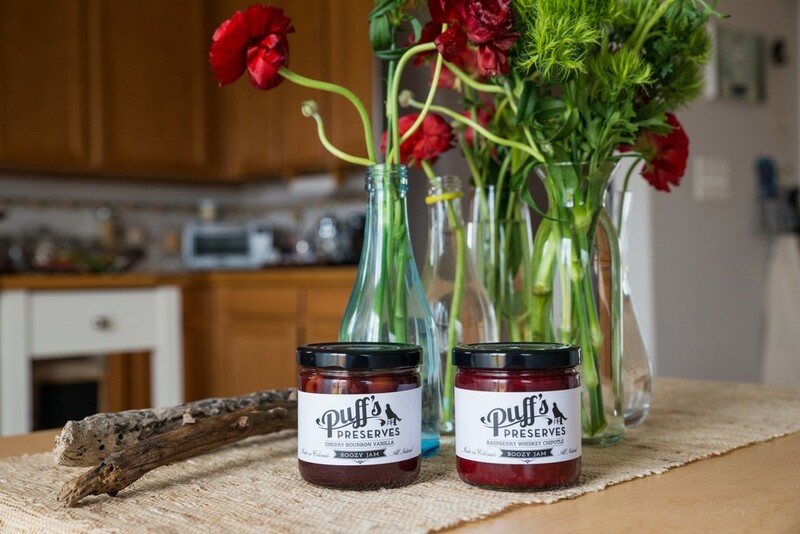 Puff's Preserves continues this familial trade with hand-crafted, artisan preserves that support Colorado brewers and distilleries through ingenious flavor pairings. What does PUff's preserves mean to you? I’m a single mom, and the schedule means I can work around my son, Isaac. I was a teacher before starting Puff’s, but I loved to cook. It was always a passion, and my products are very heavily-influenced by my grandparents—I grew up in Southeast Kansas in a family where preserving and canning were a way of life— it’s interesting to see how it’s been reintroduced as a movement of sorts. They taught me how to make all of this, and my grandma was always creative with her jams and jellies, put unique ingredients in them for flavor—that’s where a lot of my flavors come from. Inventive fruit and booze pairings. Packed with homegrown herbs and local fruit, based on the gifts of the seasons. Supports and showcases the thriving Colorado beer and spirits landscape. HOW DID BOOZE AND FRUIT COME TOGETHER FOR YOU? My grandpa bootlegged during prohibitIon like a lot of people did, but he did it heavily as a business venture—I thought I’d throw booze in as an ode to him. I’ve always made peach and bourbon jam with my grandma, probably since I was in junior high and could be at the stove during the process with those temperatures. I was laid off from teaching like a lot of teachers were that year, and that summer I took a break and took three crates of Palisade peaches back to Kansas. As soon as I got there, my grandma said ‘these are all going to go bad, we have to do something with them!” and she was pouring bourbon in, and I was adding different herbs. When I left, I brought back a ton of jars and my friend was having a garage sale and told me to sell them there. I realized then that I could make it into a business, and after getting into a farmer’s market, it just built from there. It wasn’t an accident, it just happened. WHAT'S YOUR IDEAL FLAVOR PAIRING? I love cooking with flowers and herbs—that’s what I’m really into. I really like the Raspberry Gin Rose jam, so it’s mostly the floral and herbal stuff that I gravitate towards. It’s fun to try to pair the fruit and booze, especially because the local spirits landscape is so vibrant right now. WHERE DO YOUR INGREDIENTS COME FROM? I try to grow as many of the herbs in my own garden as I can, and Savory Spice helps me source a lot of the herbs and spices that I can’t harvest from my own garden. I source as much as I can from Colorado, but it’s not really a fruit state, so there’s not a huge supply. I’ll get berries from the Pacific Northwest, but I usually get enough apples and peaches from here while they’re in season. All of the spirits are from here, and it’s mostly Peach Street—they’re huge supporters. They also hooked me up with Ska Brewing for the Apple Beer Cardamom jelly. Puff was my grandpa. He was able to bootleg because we had a family soda company back home—sugar was rationed too, so he had all the sugar from making his syrups. People were making their own wine and whiskey—further out, it would be moonshine. He did it through his company, until he was shot at by the feds, and the second time that happened I think he decided he was done. He was a really good guy, and an inspiration for Puff's. I didn’t get to be as creative as I would have liked while I was teaching, but I’ve been able to allow myself that outlet through cooking, photographing food, and creating Puff’s. I grew up in Southeast Kansas in a family where preserving and canning were a way of life— it’s interesting to see how it’s been reintroduced as a movement of sorts.